• Put flour, yeast, warm water, oil and the tsps. of sugar into a bowl and mix to make a dough. Continue to need for 10mins the put into a lightly oiled bowl and cover with lightly oiled cling film. • Leave to one side to double in size. • Mix together the tomato puree, herbs, sugar, garlic and cold water and put in the fridge until needed. • Once the dough has double in size remove from the bowl and roll out thinly on a floured surface. 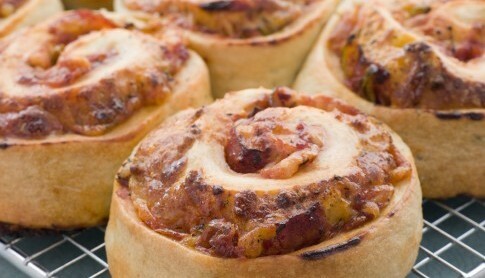 • Spread the tomato mix over the dough and then sprinkle over the cheese.